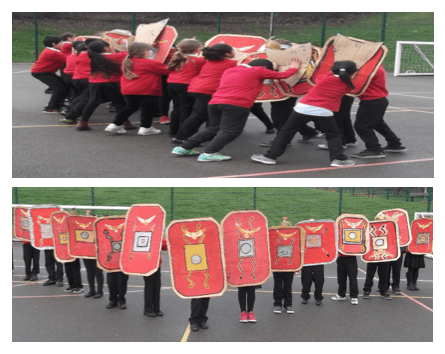 As part of the ‘I Am Warrior’ topic the Y4/3 children learnt about the Roman Army. As well as looking at armour and weapons, the children learnt how the Roman Army became such a successful and formidable force. Part of this was to research battle plans, techniques and formations to see whether we thought they would work and why. 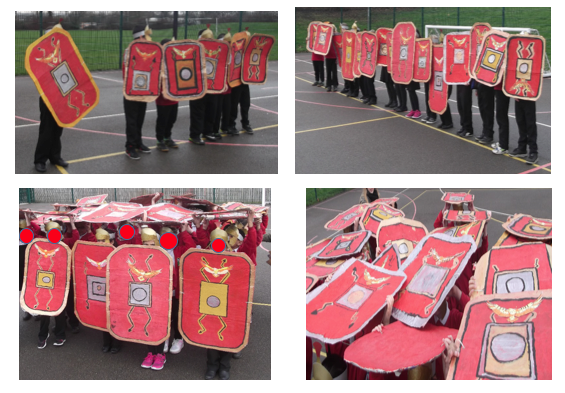 Here are some of the images of the children practising being Roman soldiers and implementing some Roman battle formations. Each child designed their own shield which they completed using papier mache and glue. The design of the shield represented both the child’s year group and school. The design also linked to the Romans as the eagle signifies the symbol of the messenger and the lightning bolt symbolises the Roman God Jupiter.